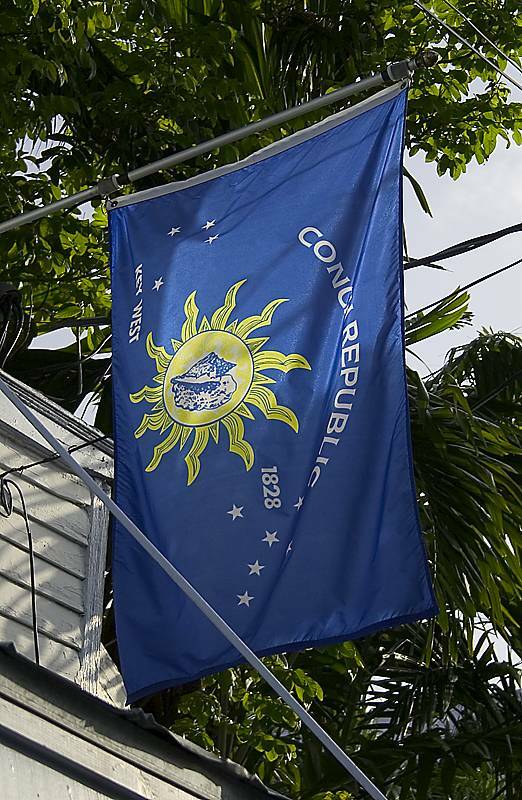 April 23 was the 35th birthday of the Conch Republic. It was an important day because once it turns middle aged it can start lying about its age. Lying is an important part of the story because a well told lie is the heart of any legend. You may not have heard of the Conch Republic, the Independent Florida Keys. To some people, that’s just as well. But the story needs to be told because it is a tale of lust, greed, power, and … well, actually, it’s just a lot of fun. You can get a lot further with a good gag than you can by being a jerk. And so it begins. In early 1982 the southern part of Florida had become a war zone. Small planes came in low over radar and boats bobbled through the Straits of Florida carrying an amazing amount of cocaine and other drugs. The Coast Guard was getting a bum’s rush and could do nothing. The money made from this trade sustained Miami, the overbuilding of condos, and an incredible number of people who wore t-shirts with white coats all the time. Something had to be done. Old Conchy. Fly it proudly! The people at US Customs decided it was time to act in a way that only they could – a technicality. It turns out that anywhere within 2 miles of a border they can set up a checkpoint and search people with no regard to pesky things like “rights”. All they had to do was declare the shoreline to be the US border and viola! They could set up a checkpoint anywhere they wanted in the Florida Keys. They looked over their maps until they found the single most annoying place to put a checkpoint, which is right where US1 joined the Keys to the mainland at Card Sound. Because this was technically a border, they didn’t have worry about silly things like “warrants” or “probable cause” or “basic decency”. Well meaning lawyers, civil libertarians, ordinary citizens, and other troublemakers would tell them that they could not search the trunk of their car and start reciting the Constitution, only to have said trunk pried open with crowbar. Tourists stayed away, crippling the only industry that can be formed around lying down doing nothing. The lines in and out of the Keys stretched on for hours, delaying critical supplies like food and beer. The situation was desperate. When the going gets weird, the weird get going. It was a moment made for Key West. The first shot came on April 23rd. Key West Mayor Dennis Wardlow declared that since the Keys were being treated as a foreign nation, henceforth they would be known as a sovereign nation. It was shocking because no one in the Keys ever used words as big as “henceforth” or “sovereign”. At noon they took down the US flag and raised the banner of the Conch Republic, fired a cannon, waited five minutes, surrendered to the US, and then applied for foreign aid. It was a brief but intense moment of great pride for the new nation. With things opening up, this year had some special celebrations. The Revolution was a two-pronged strategy based on getting extremely good PR and developing a great excuse for a party. It was probably the most successful Revolution in world history. Within days the border guards left in humiliation and the Keys has held annual celebrations every year since. It may come as a bit of a shock to some people to learn that the Conch Republic is not popular throughout the Keys. The problem is a simple one: not everyone likes Key West. It’s not homophobia or anything as grand as that, it’s simply that the old-timers of the Keys are not a people who would ever organize to do anything. It’s a culture based on the ethics of piracy, fishing, and wrecking – scooping up the remains of ships that have wrecked on the shallow coast. The residents of the Keys, known as Conchs, not only pronounce it like “conk” but value independence, stubbornness, and being left alone. They really don’t care what you think. Despite these political differences, the Conch Republic carries on. Posts in the government are routinely auctioned off to the highest bidder to ward off private corruption by encouraging very public corruption. Their unofficial National Anthem is Jimmy Buffet’s “Margaritaville”, which sadly has never been played at an Olympic Ceremony because they have never bothered to even try to get a team together. And every year there is another excuse for a party. What is the point of this story? If there has to be one, it is simply that you can get a lot further with a funny story than a lot of angry ranting. It’s probably best to leave it as pointless as an April day in the Florida Keys, a way of life that you just have to be there to understand. This entry was posted in People & Culture and tagged Conch Republic, history, people. Bookmark the permalink. We just recently visited the conch republic. Thanks for sharing the history behind it. Cool post!